Susan Szenasy has been the editor in chief of Metropolis magazine, a New York-based publication devoted to world design and architecture, for almost 30 years. She is an internationally recognized authority on sustainability and design, and sits on the board of organizations like the Council for Interior Design Accreditation and the Landscape Architecture Foundation. Susan recently came to Seattle to share a dialogue with an interested audience at an overflowing Seattle Design Festival event at Cornish College. I had an opportunity to sit down with Susan the morning after the event and hear a bit more about why she thinks the next big thing in art and architecture will come out of Seattle. The following is an excerpt from our discussion on September 9th over breakfast. I’m not interested in the word sustainability because it’s a marketing word. It doesn’t fully describe the idea of how to approach the built environment in a more systematic way, it’s just great design and architecture. I think looking at the conditions that exist in a place [where you are going to build] are absolutely key to anything that’s designed – architecture, urban planning, and so on – because the conditions are different everywhere. I think that idea of connecting to climate is absolutely essential, connecting to the water or the wind conditions, and connecting to a culture. Here in Seattle, the weather is so particular and so incredibly pleasant. What is the most stylistic way of dealing with these elements – capturing the wind, capturing the sun? Here you have to capture the sun instead of hiding from it! Think about these things when making a building within a larger context. You can’t just plunk [a building] down and not worry about what’s around it – this is much more complex than just knowing who your neighbors are. I know many architects who are excited about working on old buildings, they discover something that they can use. They study the context – when it was built, what it was made of, how the cross-ventilation worked, how [the building] sat on the land – it’s very different from the one-size-fits-all modalism that everyone is practicing. When the building is constructive to the architect, it becomes really relevant and beautiful for the users and the community. That’s the best scenario. 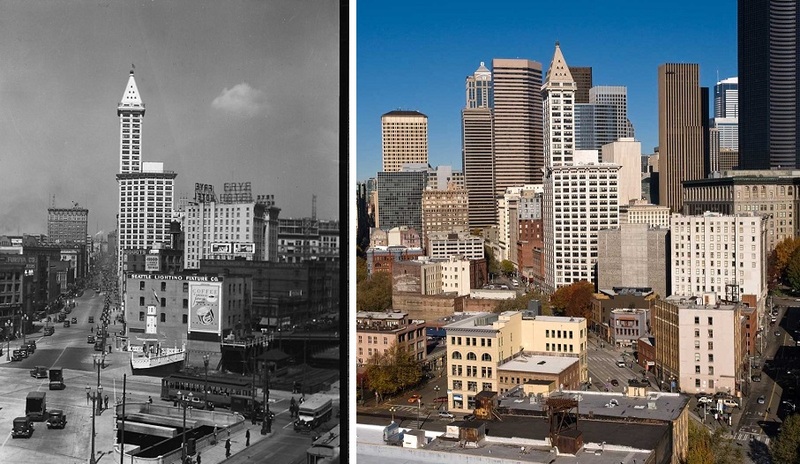 Smith Tower is a great example of enduring Seattle design, shown here in 1929 and again more than 80 years later. West coast architecture is very different than the east coast: more realistic, more down-to-the-ground, more community-oriented and less theory-driven. There’s more of a community feeling out here, that’s how I see it as someone from the east. Ivy Leagues can afford to bring in very well-known architects, and of course the students are excited to have a role model that’s supposed to have conquered the world. But you forget that maybe that’s not the whole story. [It’s] about what good design should be, and not achieving this great stardom. It’s interesting to see the difference in the more humble, extremely smart, really interested kids that are in the smaller colleges. There’s something so grounded, so real, so unpretentious about them. 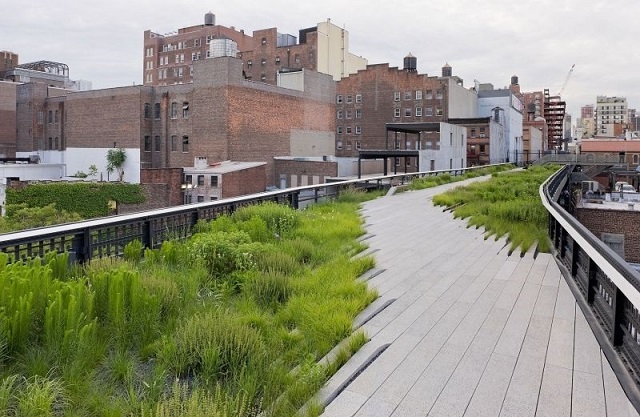 Susan thinks New York City’s High Line is a great example of successful landscape architecture. It creates a space with a local historical identity, in a city built from countless different cultures. [The event] last night brought all the landscape architects and I like that. I think it has become a very big element, some of the most interesting things that are happening now in cities are led by landscape architecture. How do you define “local” in a place when there’s nothing local about it? I see more and more projects where the landscape architects are very involved in the early planning stages of a building. Landscaping is really understanding the contexts – the conditions of the water tables, what happens seasonally, how do you keep plants alive in the non-growing season? How do you create something that is really interesting for anybody who visits those buildings throughout the year? And that’s landscape architecture at its best, and I have to say that new landscape architecture is really rising to the challenge. I was judging a competition about seven or eight years ago, I was on the jury with a bunch of landscape architects. I was asking about the site: the flora, what kind of native plants grow here and why, what the potential was for growing in that particular climate. And none of them knew, which shocked me! Plants are their medium. The only person who answered my questions was Rich Haag from Seattle [known locally for his work on Gasworks Park]. And even five years ago you didn’t see that kind of outreach, that larger understanding of the area. An architect needs [more information] to be able to take the building to the next level of understanding. A more official (but less detailed) review of the Seattle Design Festival event is available at DesignInPublic.org: Szenasy Packs Cornish Auditorium for SDF2014. My 2011 article Susan Szenasy Visits Portland to talk Green Building is available on the Glumac website. This entry was posted in Exploring our World, Interview, Music and Art, The Seattle Scene and tagged buildings and structures, Cornish College, Design In Public, Gasworks Park, Glumac, High Line, history, landscape architecture, Metropolis magazine, Richard Haag, SDF2014, Seattle Design Festival, Smith Tower, Susan Szenasy, sustainability. Bookmark the permalink.